with Osiel Gouneo and Eugenie Skilnand in the titelroles at the operahouse in Oslo. By Henning Høholt, Photos by Erik Berg. 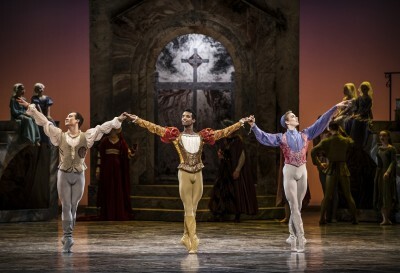 OSLO/NORWAY: Once again a success with the Norwegian Nationalballet at the Opera in Oslo. Michael Corder is back staging his 1992 production with the wonderful dancers in the Oslo company. Five cast in the titelroles is a lot. The first night was starred by Osiel Gouneo and Eugenie Skilnand. It became an exgraordinary event. Eugenie has it all, the youthness, innocense, virtuocity, feelings, temperament, and she can play and perform all these dramatically dramatically demanding parts, so the audience fully trust in her. Her backwards tootip running is extraordinary well made. For the first time together with our wonderful Cuban dancer Osiel Gouneo, powerfull, wonderful legs (in all directions). virtuocity, charming, flirting, 100% present on stage from the very first to the very last step when he dies on stage. Bravi. Samantha Lynch is new as Julies Amme, where she is following great in the humoristic, and seriouse footsteps to Britt Friberg. Lynch grows into that demanding character role perfect, and in this idea. Samantha Lynch follows up, and is even more sharp towards the guys inclusive Lorenz Garcia as her tenant, they together brings a lot of joy, humor and charm to the stage, a good casting. As Lord and Lady Capulet we enjoyed Ole Willy Falkhaugen and Hedda Staver Cooke who does a good and dramatic job. The many children on stage functioned well, and made it all alive. The Mandolin dance was great led by the two soloists Lucas Lima and Miharu Maki. Dirk Weyershausen dances and performs the role as Prince Paris very good. 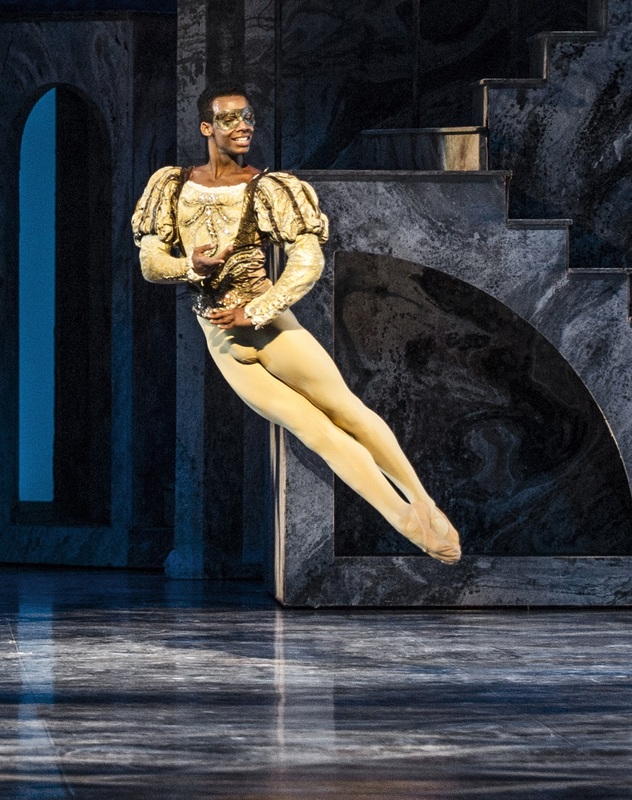 The one man that Juliets parents, Lord and Lady Capulet has choosen to be her husband, Their pas de deux´s together is of high quality and beauty. The 6 girlfriends of Julie is deliciouse dancing their parts. Emma Lloyd, Lisa Nielsen, Chihiro Nomura, Grete Sofie B. Nybakken, Sofia Skjønneberg, Kathryn Walsh Thomas. The ballet chief is continuing the tradition to invite former soloists to play character roles in importent character roles. This is also the case in this production, It is a pleasure to enjoy Mariusz Malecki as the Duce of Venezia and and Brian Toney as Lord Montague. The many big groups at the market square and in the Montague house inclusive the Pavane is being performed very well by all the company, it seems clear to me, that, the company has had a good, as allways well organized rehersal periode. This Romeo and Juliet production has been growing and growing. Michael Corders rather difficult choreography is well taken care of and up to date, as I remember it 22 years ago, but now the dancers knows it, and manage it well. Corder is not making it easy for himself or for the company Still that the company have had many demanding projects this autumn inclusive international visits to Paris and St. Petersburg. And now soon ready to fulfill the Nutcracker once again staged by Dinna Bjørn. The dramatic fights between the groups and specially between the leading male soloists, look real, and worked well. 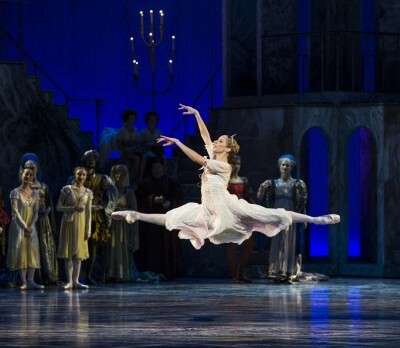 The whole ballet is full of dramatic highlights. The rolling tempo in the performance is good, the changing opf the scenography worked very well from the technical side. Light underlined the moods. Eugenie Skilnand and Samantha Lynch (as Juliet’s nurse) left . Foto Erik Berg. The very beautiful costumes by Nadine Bailey, who also is responsibel for the scenography, is a hit and the dancers are good presenting the big outfits, which still looks light and floating on stage. It shows a feeling of exclusivity, and the little feeling of the Italian high society are present, but also of th edaily life at the square and market place. Inclusive the religiouse oarade and ceremonies. The performance is moving forward never stops, nearly like a film. but in the middle of the floating atmosphaere it includes the scenes of lovae, passion, dramatically and full of feeling. I have the feeling that this production will be historically together with Dinna Bjørns Nutcracker. Will Romeo and Julie be, or is it allready taped for TV? Musically, theo orchestra sounded brilliant, Prokofiev is demanding but this was great, I only catched a few mistakes in the end. The Mandolin dance was virtuose. The orchestra led by the conductor Ben Pope was had a good evening, it sounded inspired. Concertmaster was Catharina Chen. The applause was long and warm, the opening night was also an Operaclub evening, where some 100´s of its members are present, OPERAKLUBBEN´s presence allways gives an extraordinary good atmosphaere. Applause for romeo and Julie, from left Scott Casban, Ben Pope, Eugenie Skilnand, Michael Corder, Osiel Gouneo, Aarne Kristian Ruutu, Douwe Dekkers, behind some of Julies girlfriends. Photo Tomas Bagackas.